Some of you may or may not have heard about bike commuter, Michael McNair, being hit by a car on his commute to work last Tuesday. 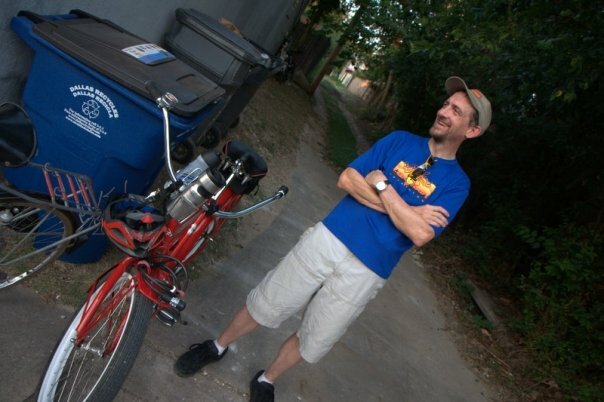 CYCLIST HIT – For those of you that know MMACH5 / Michael Tripp McNair…was hit by a car today on his commute to work. He is in the Baylor ICU unit downtown with a broken neck and hips, lacerated spleen and many other injuries… Please pass the word and put him in your thoughts. The latest update (as of Thursday) he made it through his hip surgery and all is still going smoothly. He is still sedated, but hopefully they’ll bring him out of it after another day or so. They are planning another MRI and will most likely do surgery on his ribs (Friday) and he’ll be in ICU until next week at least. They’ve said that due to all of his hip and pelvis fractures that his legs will be non-weight bearing for at least 3 months. The driver did stop and, reportedly, was the one who called 911. As you can see, Michael has a long, uphill battle for a full recovery – and our thoughts and prayers go to him and his family. If you are wondering how you can help, friends have set up a ChipIn page for donations. Every little bit helps – even just a couple of bucks. Click here to donate.